Fits most medium to large heads. Sporty, solid, wrap around design. Holds high prescriptions,Combined power limits - 6.00 to + 3.00. Another option in colored lenses is a tint, which is an external coating, and remains constant at all times. Light tints are used primarily for cosmetic purposes to enhance a wearer's looks, while darker tints can be used as sunglasses, however polarized lenses are preferred for sun lenses, as described above. 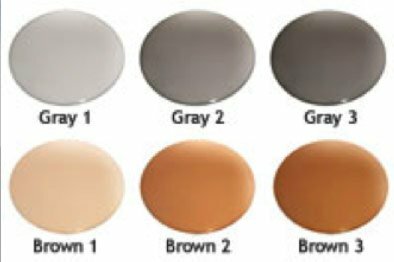 The most common tint colors are grey & brown. Tints are applied to lens materials through a process of absorption. Lenses are immersed into a warm color bath, and depending on the length of time they sit in the tank, emerge in varying shades of darkness. NOTE: Gradient tints are not OSHA approved. Anti Reflective (or Anti Glare) is a 9-layer multi treated process. AR treated lenses eliminating glare, improving light transmission and reducing smudges & scratches. 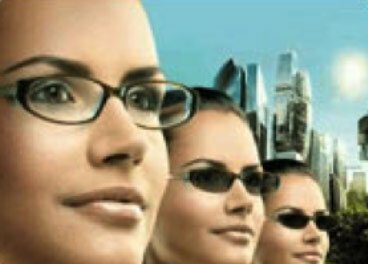 Anti Glare coating can make lenses seem invisible, eliminates reflections that obscure the eyes. AR stops reflections on front and back surfaces causing annoying distractions that make it more difficult to see and add to eyestrain. Driving comfort and computer use are enhanced by reducing glare occurring in these activities. AR reduces glare and increases light transmission to 99%. This improves general vision especially for high index lenses and transitions that transmit less light.